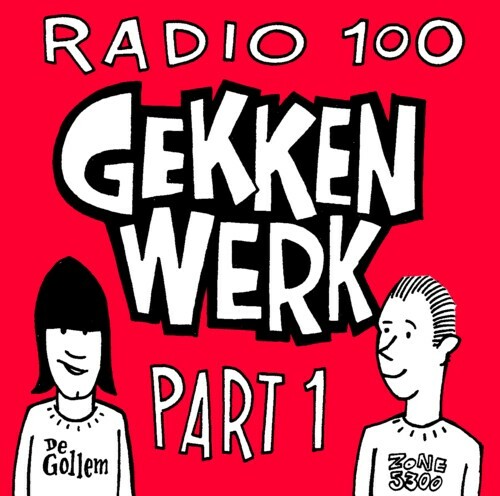 Before Milan Hulsing and i started doing the weekly Radio 100 show “Gekkenwerk” , i did this show on my own. It was called ” Fool’s Gold” and i did it in English because i wanted to learn to speak this language better. At that moment i still believed i would be a popular radiomaker one day, and since the Internet was already becoming the new radio, i thought i’d better learn to do it in English. I just discovered a box with cassettes of this show, which i thought i had already erased. I have not found the courage yet to listen to these recordings; i remember that i was often trying to do something that was way above my head. But after doing this show for two years or so (maybe more, i really cannot remember) Milan Hulsing became a frequent guest, which changed the direction of the show in a welcome way. And soon we decided to do it together. And for the die hards: the first mp3 cd of “Gekkenwerk” is finished. There is no chronological order in the shows on this cd: i just recorded what i could find. There are enough cassettes and minidiscs left for at least two more cd’s, but the sound quality is often very lousy, so i doubt wether it is worth the effort to digitalise all of this material. If you want this cd, just make me an offer i can’t refuse and i sent it right away.